Jordan Hamilton gathers herself for a layup. The freshman guard and the Wildcats face a stiff test on the road at No. 21 Michigan on Thursday. When Pallas Kunaiyi-Akpanah received the ball in the post with three seconds to go Sunday at Indiana, she knew what to expect. Last year, the junior forward said she would have been less assertive with the clock winding down. This time, she attacked the rim and made a confident move toward the basket. 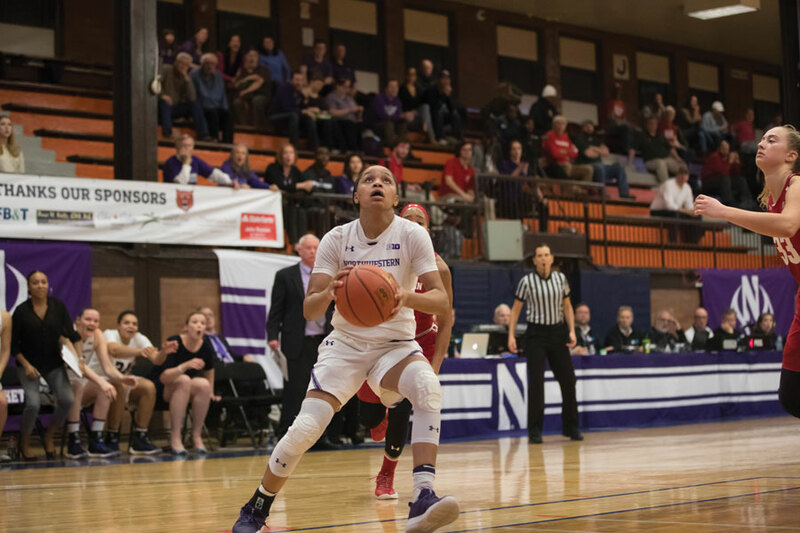 But the officials called her for a travel, and Northwestern (9-15, 2-8 Big Ten) lost 78-73 in overtime, continuing its trouble putting games away late. Before dropping this opportunity to earn their third Big Ten win, the Wildcats, who play No. 21 Michigan on Thursday, lost to No. 11 Maryland two weeks ago in part because of freshman guard Lindsey Pulliam’s turnover in the final minute. In a game before that at Purdue, NU’s inability to force the Boilermakers into turnovers cost it the win. Much has been made of NU’s five new starters this season, but after its first three conference losses were by double digits, coach Joe McKeown said the Cats are posing new challenges to their Big Ten competition. After averaging 12.2 points in her first five Big Ten games, Pulliam, the reigning Big Ten freshman of the week, scored 15 points or more in four of her last five games. Against the Hoosiers, she scored a career-high 33 and fueled her team to close a 16 point gap before losing in overtime. Pulliam’s consistent scoring has been one of the areas of improvement, and another has been Kunaiyi-Akpanah’s dynamic play. While she averaged just 1.6 points and 3.8 rebounds per game in an injury-shortened season as a sophomore, Kunaiyi-Akpanah ranks 15th in the country with 11.4 rebounds per game and scores in double figures as well. Her improved play has caused McKeown to trust her in clutch opportunities, like the shot she made against Indiana that the officials waved off. Kunaiyi-Akpanah said she learned from the missed opportunity. Heading into Thursday’s game in Ann Arbor and their second game in two weeks against Michigan, McKeown said the Cats need to maintain their level of play for 40 minutes after failing in the second half against the Wolverines in their last meeting. But with six remaining games until the Big Ten Tournament, and four of them against top teams in the conference, he said the team isn’t concerned about its losing record.